"Om Shanti" redirects here. For the 2010 film, see Om Shanti (film). For other uses, see Mantra (disambiguation). 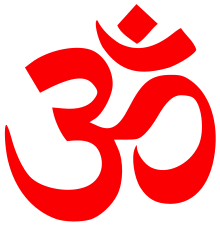 The Om syllable is considered a mantra in its own right in the Vedanta school of Hinduism. In Tibet, many Buddhists carve mantras into rocks as a form of meditation. A mantra (Sanskrit: मन्त्र, translit. mantra, English pronunciation /ˈmæntrə, ˈmɑːn-, ˈmʌn-/) is a sacred utterance, a numinous sound, a syllable, word or phonemes, or group of words in Sanskrit believed by practitioners to have psychological and spiritual powers. Mantra meditation helps to induce an altered state of consciousness. A mantra may or may not have a syntactic structure or literal meaning. The earliest mantras were composed in Vedic Sanskrit by Hindus in India, and are at least 3000 years old. Mantras now exist in various schools of Hinduism, Buddhism, Jainism, and Sikhism. In Japanese Shingon tradition, the word Shingon means mantra. Similar hymns, antiphons, chants, compositions, and concepts are found in Zoroastrianism, Taoism, Christianity, and elsewhere. The use, structure, function, importance, and types of mantras vary according to the school and philosophy of Hinduism and Buddhism. Mantras serve a central role in tantra. In this school, mantras are considered to be a sacred formula and a deeply personal ritual, effective only after initiation. In other schools of Hinduism, Buddhism, Jainism or Sikhism, initiation is not a requirement. Mantras come in many forms, including ṛc (verses from the Rigveda for example) and sāman (musical chants from the Sāmaveda for example). They are typically melodic, mathematically structured meters, believed to be resonant with numinous qualities. At its simplest, the word ॐ (Aum, Om) serves as a mantra. In more sophisticated forms, mantras are melodic phrases with spiritual interpretations such as a human longing for truth, reality, light, immortality, peace, love, knowledge, and action. Some mantras have no literal meaning, yet are musically uplifting and spiritually meaningful. The Sanskrit word mantra- (m.; also n. mantram in Tamil) consists of the root man- "to think" (also in manas "mind") and the suffix -tra, designating tools or instruments, hence a literal translation would be "instrument of thought". Scholars consider mantras to be older than 1000 BC. By the middle Vedic period—1000 BC to 500 BC—claims Frits Staal, mantras in Hinduism had developed into a blend of art and science. The Chinese translation is 眞言, 真言; zhenyan; 'true words', the Japanese on'yomi reading of the Chinese being shingon (which is also used as the proper name for the prominent esoteric Shingon sect). According to Bernfried Schlerath, the concept of sātyas mantras is found in Indo-Iranian Yasna 31.6 and the Rigveda, where it is considered structured thought in conformity with the reality or poetic (religious) formulas associated with inherent fulfillment. Mantras are neither unique to Hinduism nor other Indian religions such as Buddhism; similar creative constructs developed in Asian and Western traditions as well. Mantras, suggests Frits Staal, may be older than language. There is no generally accepted definition of mantra. Renou has defined mantra as a thought. Mantras are structured formulae of thoughts, claims Silburn. Farquhar concludes that mantras are a religious thought, prayer, sacred utterance, but also believed to be a spell or weapon of supernatural power. Zimmer defines mantra as a verbal instrument to produce something in one’s mind. Bharati defines mantra, in the context of the Tantric school of Hinduism, to be a combination of mixed genuine and quasi-morphemes arranged in conventional patterns, based on codified esoteric traditions, passed on from a guru to a disciple through prescribed initiation. Jan Gonda, a widely cited scholar on Indian mantras, defines mantra as general name for the verses, formulas or sequence of words in prose which contain praise, are believed to have religious, magical or spiritual efficiency, which are meditated upon, recited, muttered or sung in a ritual, and which are collected in the methodically arranged ancient texts of Hinduism. There is no universally applicable uniform definition of mantra because mantras are used in different religions, and within each religion in different schools of philosophy. In some schools of Hinduism for example, suggests Gonda, a mantra is sakti (power) to the devotee in the form of formulated and expressed thought. Staal clarifies that mantras are not rituals, they are what is recited or chanted during a ritual. In Oxford Living Dictionary mantra is defined as a word or sound repeated to aid concentration in meditation. Cambridge Dictionary provides two different definitions. The first refers to Hinduism and Buddhism: a word or sound that is believed to have a special spiritual power. The second definition is more general: a word or phrase that is often repeated and expresses a particularly strong belief. For instance, a football team can choose individual words as their own "mantra." There is a long history of scholarly disagreement on the meaning of mantras and whether they are instruments of mind, as implied by the etymological origin of the word mantra. One school suggests mantras are mostly meaningless sound constructs, while the other holds them to be mostly meaningful linguistic instruments of mind. Both schools agree that mantras have melody and a well designed mathematical precision in their construction and that their influence on the reciter and listener is similar to that is observed in people around the world listening to their beloved music that is devoid of words. Staal presents a non-linguistic view of mantras. He suggests that verse mantras are metered and harmonized to mathematical precision (for example, in the viharanam technique), which resonate, but a lot of them are a hodgepodge of meaningless constructs such as are found in folk music around the world. Staal cautions that there are many mantras that can be translated and do have spiritual meaning and philosophical themes central to Hinduism, but that does not mean all mantras have a literal meaning. He further notes that even when mantras do not have a literal meaning, they do set a tone and ambiance in the ritual as they are recited, and thus have a straightforward and uncontroversial ritualistic meaning. The sounds may lack literal meaning, but they can have an effect. He compares mantras to bird songs, that have the power to communicate, yet do not have a literal meaning. On that saman category of Hindu mantras, which Staal described as resembling the arias of Bach's oratorios and other European classics, he notes that these mantras have musical structure, but they almost always are completely different from anything in the syntax of natural languages. Mantras are literally meaningless, yet musically meaningful to Staal. The saman chant mantras were transmitted, from one Hindu generation to next, verbally for over 1000 years, but never written, and a feat suggests Staal that was made possible by the strict mathematical principles used in constructing the mantras. These saman chant mantras are also mostly meaningless, cannot be literally translated as Sanskrit or any Indian language, but nevertheless are beautiful in their resonant themes, variations, inversions, and distribution. They draw the devotee in. Staal is not the first person to view Hindu mantras in this manner. The ancient Hindu Vedic ritualist Kautsa was one of the earliest scholars to note that mantras are meaningless; their function is phonetic and syntactic, not semantic. Harvey Alper and others present mantras from the linguistic point view. They admit Staal's observation that many mantras do contain bits and pieces of meaningless jargon, but they question what language or text doesn't. The presence of an abracadabra bit does not necessarily imply the entire work is meaningless. Alper lists numerous mantras that have philosophical themes, moral principles, a call to virtuous life, and even mundane petitions. He suggests that from a set of millions of mantras, the devotee chooses some mantras voluntarily, thus expressing that speaker's intention, and the audience for that mantra is that speaker's chosen spiritual entity. Mantras deploy the language of spiritual expression, they are religious instruments, and that is what matters to the devotee. A mantra creates a feeling in the practicing person. It has an emotive numinous effect, it mesmerizes, it defies expression, and it creates sensations that are by definition private and at the heart of all religions and spiritual phenomena. During the early Vedic period, claims Staal, Vedic poets became fascinated by the inspirational power of poems, metered verses, and music. They referred to them with the root dhi-, which evolved into dhyana (meditation) of Hinduism, and the language used to start and assist this process manifested as a mantra. By the middle vedic period (1000 BC to 500 BC), mantras were derived from all vedic compositions. They included ṛc (verses from Rigveda for example), sāman (musical chants from the Sāmaveda for example), yajus (a muttered formula from the yajurveda for example), and nigada (a loudly spoken yajus). During the Hindu Epics period and after, mantras multiplied in many ways and diversified to meet the needs and passions of various schools of Hinduism. Mantras took a center stage in the Tantric school, which posited that each mantra (bijas) is a deity; it is this distinct school of Hinduism and 'each mantra is a deity' reasoning that led to the perception that some Hindus have tens of millions of gods. One function of mantras is to solemnize and ratify rituals. Each mantra, in Vedic rituals, is coupled with an act. According to Apastamba Srauta Sutra, each ritual act is accompanied by one mantra, unless the Sutra explicitly marks that one act corresponds to several mantras. According to Gonda, and others, there is a connection and rationale between a Vedic mantra and each Vedic ritual act that accompanies it. In these cases, the function of mantras was to be an instrument of ritual efficacy for the priest, and a tool of instruction for a ritual act for others. Over time, as the Puranas and Epics were composed, the concepts of worship, virtues and spirituality evolved in Hinduism. Religions such as Jainism and Buddhism branched off, and new schools were founded, each continuing to develop and refine its own mantras. In Hinduism, suggests Alper, the function of mantras shifted from the quotidian to redemptive. In other words, in Vedic times, mantras were recited a practical, quotidian goal as intention, such as requesting a deity's help in the discovery of lost cattle, cure of illness, succeeding in competitive sport or journey away from home. The literal translation of Vedic mantras suggests that the function of mantra, in these cases, was to cope with the uncertainties and dilemmas of daily life. In a later period of Hinduism, mantras were recited with a transcendental redemptive goal as intention, such as escape from the cycle of life and rebirth, forgiveness for bad karma, and experiencing a spiritual connection with the god. The function of mantras, in these cases, was to cope with the human condition as a whole. According to Alper, redemptive spiritual mantras opened the door for mantras where every part need not have a literal meaning, but together their resonance and musical quality assisted the transcendental spiritual process. Overall, explains Alper, using Śivasūtra mantras as an example, Hindu mantras have philosophical themes and are metaphorical with social dimension and meaning; in other words, they are a spiritual language and instrument of thought. According to Staal, Hindu mantras may be spoken aloud, anirukta (not enunciated), upamsu (inaudible), or manasa (not spoken, but recited in the mind). In ritual use, mantras are often silent instruments of meditation. The most basic mantra is Om, which in Hinduism is known as the "pranava mantra," the source of all mantras. The Hindu philosophy behind this is the premise that before existence and beyond existence is only One reality, Brahman, and the first manifestation of Brahman expressed as Om. For this reason, Om is considered as a foundational idea and reminder, and thus is prefixed and suffixed to all Hindu prayers. While some mantras may invoke individual gods or principles, fundamental mantras, like the 'Shanti Mantra, the 'Gayatri Mantra' and others all ultimately focus on the One reality. In the Tantric school the universe is sound. The supreme (para) brings forth existence through the Word (Shabda). Creation consists of vibrations at various frequencies and amplitudes giving rise to the phenomena of the world. Buhnemann notes that deity mantras are an essential part of Tantric compendia. The tantric mantras vary in their structure and length. Mala mantras are those mantras which have an enormous number of syllables. In contrast, bija mantras are one-syllabled, typically ending in anusvara (a simple nasal sound). These are derived from the name of a deity; for example, Durga yields dum and Ganesha yields gam. Bija mantras are prefixed and appended to other mantras, thereby creating complex mantras. In the tantric school, these mantras are believed to have supernatural powers, and they are transmitted by a preceptor to a disciple in an initiation ritual. Tantric mantras found a significant audience and adaptations in medieval India, Hindu Southeast Asia and numerous Asian countries with Buddhism. Majumdar and other scholars suggest mantras are central to the Tantric school, with numerous functions. From initiating and emancipating a tantric devotee to worshiping manifested forms of the divine. From enabling heightened sexual energy in the male and the female to acquiring supernormal psychological and spiritual power. From preventing evil influences to exorcizing demons, and many others. These claimed functions and other aspects of the tantric mantra are a subject of controversy among scholars. Tantra usage is not unique to Hinduism: it is also found in Buddhism both inside and outside India. Mantra japa is a practice of repetitively uttering the same mantra for an auspicious number of times, the most popular being 108, and sometimes just 5, 10, 28 or 1008. Japa is found in personal prayer or meditative efforts of some Hindus, as well during formal puja (group prayers). Japa is assisted by malas (bead necklaces) containing 108 beads and a head bead (sometimes referred to as the 'meru', or 'guru' bead); the devotee using his/her fingers to count each bead as he/she repeats the chosen mantra. Having reached 108 repetitions, if he/she wishes to continue another cycle of mantras, the devotee turns the mala around without crossing the head bead and repeats the cycle. Japa-yajna is claimed to be most effective if the mantra is repeated silently in mind (manasah). According to this school, any shloka from holy Hindu texts like the Vedas, Upanishads, Bhagavad Gita, Yoga Sutra, even the Mahabharata, Ramayana, Durga saptashati or Chandi is a mantra, thus can be part of the japa, repeated to achieve a numinous effect. The Dharmasāstra claims Gāyatri mantra derived from Rig Veda verse 3.62.10, and the Purușasūkta mantra from Rig Veda verse 10.90 are most auspicious mantras for japa at sunrise and sunset; it is claimed to purify the mind and spirit. The Gayatri mantra is considered one of the most universal of all Hindu mantras, invoking the universal Brahman as the principle of knowledge and the illumination of the primordial Sun. The mantra is extracted from the 10th verse of Hymn 62 in Book III of the Rig Veda. "Let us meditate on that excellent glory of the divine Light (Vivifier, Sun). May he stimulate our understandings (knowledge, intellectual illumination). असतोमा सद्गमय । तमसोमा ज्योतिर् गमय । मृत्योर्मामृतं गमय ॥ asato mā sad gamaya, tamaso mā jyotir gamaya, mṛtyor māmṛtaṃ gamaya. "from the unreal lead me to the real, from the dark lead me to the light, from death lead me to immortality. There are numerous other important mantras. Apart from Shiva Sutras, which originated from Shiva's tandava dance, the Shiva Sutras of Vasugupta are a collection of seventy-seven aphorisms that form the foundation of the tradition of spiritual mysticism known as Kashmir Shaivism. They are attributed to the sage Vasugupta of the 9th century C.E. Sambhavopaya (1-1 to 1–22), Saktopaya (2-1 to 2–10) and Anavopaya (3-1 to 3–45) are the main sub-divisions, three means of achieving God consciousness, of which the main technique of Saktopaya is a mantra. But "mantra" in this context does not mean incantation or muttering of some sacred formula. The word "mantra" is used here in its etymological signification. That which saves one by pondering over the light of Supreme I-consciousness is a mantra. The divine Supreme I-consciousness is the dynamo of all the mantras. Deha or body has been compared to wood, "mantra" has been compared to arani—a piece of wood used for kindling fire by friction; prana has been compared to fire. Sikha or flame has been compared to atma (Self); ambara or sky has been compared to Shiva. When prana is kindled by means of mantra used as arani, fire in the form of udana arises in susumna, and then just as flame arises out of kindled fire and gets dissolved in the sky, so also atma (Self) like a flame having burnt down the fuel of the body, gets absorbed in Shiva. The Transcendental Meditation technique, also known as 'TM', uses mantras that are assigned to the practitioner to be used as thought sound only, not chanted, without connection to any meaning or idea. The spiritual exercises of Surat Shabda Yoga include simran (repetition, particularly silent repetition of a mantra given at initiation), dhyan (concentration, viewing, or contemplation, particularly on the Inner Master), and bhajan (listening to the inner sounds of the Shabda or the Shabda Master). Repetition of a "mantram" (i.e., mantra) or holy name is Point 2 in the eight-point Passage Meditation program taught by Eknath Easwaran, who recommended using a mantram drawn from a faith tradition, east or west. The mantram is to be used frequently throughout the day, at opportune moments. This method of mantram repetition, and the larger program, was developed for use in any major faith tradition, or outside all traditions. Easwaran's method of mantram repetition has been the subject of scientific research at the San Diego Veterans Administration, which has suggested health benefits that include managing stress and reducing symptoms of PTSD. The concept of mantras in Jainism is not focused on material aspects, rather mainly deals with seeking forgiveness, praising Arihants, or deities like Nakoda, Padmavati, Manibhadra, Saraswati, Lakshmi, and others. Yet some mantras are claimed to enhance intellect, prosperity, wealth or fame. There are many mantras in Jainism; most of them are in Sanskrit or Prakrit, but in the last few centuries, some have been composed in Hindi or Gujrati languages. Mantras, couplets, are either chanted or sung, either aloud or by merely moving lips or in silence by thought. Some examples of Jain mantras are Bhaktamara Stotra, Uvasagharam Stotra, etc. But the greatest is said to be the Namokar or Navkar Mantra. The Navkar Mantra (literally, "Nine Line Mantra") is a central mantra in Jainism. The initial 5 lines consist of salutations to various sanctified souls, and the latter 4 lines are explanatory in nature, highlighting the benefits and greatness of this mantra. Namo Arihantânam I bow to the Arihantâs (Conquerors). Namo Siddhânam I bow to the Siddhâs (Liberated Souls). Namo Âyariyânam I bow to the Âchâryas (Preceptors or Spiritual Leaders). Namo Uvajjhâyanam I bow to the Upadhyâya (Teachers). Namo Loe Savva Sahûnam I bow to all the Sadhûs in the world (Saints or Sages). and of all auspicious mantras, (it) is the foremost auspicious one. Khāmemi savva-jīve savvë jive khamantu me I ask pardon of all creatures, may all creatures pardon me. Mitti me savva-bhūesu, veraṃ mejjha na keṇavi May I have a friendship with all beings and enemy with none. In Jainism, forgiveness is one of the main virtues to be cultivated. Kṣamāpanā or supreme forgiveness forms part of one of the ten characteristics of dharma. In the pratikramana prayer, Jains repeatedly seek forgiveness from various creatures—even from ekindriyas or single sensed beings like plants and microorganisms that they may have harmed while eating and doing routine activities. Forgiveness is asked by uttering the phrase, Micchāmi dukkaḍaṃ. Micchāmi dukkaḍaṃ is a Prakrit phrase literally meaning "may all the evil that has been done be fruitless." May you, O Revered One, voluntarily permit me. I would like to confess my sinful acts committed while walking. I honour your permission. I desire to absolve myself of the sinful acts by confessing them. I seek forgiveness from all those living beings which I may have tortured while walking, coming and going, treading on a living organism, seeds, green grass, dew drops, ant hills, moss, live water, live earth, spider web and others. I seek forgiveness from all these living beings, be they one sensed, two sensed, three sensed, four sensed or five sensed, which I may have kicked, covered with dust, rubbed with earth, collided with other, turned upside down, tormented, frightened, shifted from one place to another or killed and deprived them of their lives. (By confessing) may I be absolved of all these sins. Very often mantra practice is combined with breathing meditation so that one recites a mantra simultaneously with in-breath and out-breath to help develop tranquility and concentration. Mantra meditation is especially popular among the lay people. Like other basic concentration exercises, it can be used simply to the mind, or it can be the basis for an insight practice where the mantra becomes the focus of observation of how life unfolds, or an aid in surrendering and letting go." The "Buddho" mantra is widespread in the Thai Forest Tradition and was taught by Ajahn Chah and his students. Another popular mantra in Thai Buddhism is Samma-Araham, referring to the Buddha who has 'perfectly' (samma) attained 'perfection in the Buddhist sense' (araham), used in Dhammakaya meditation. In the Tantric Theravada tradition of Southeast Asia, mantras are central to their method of meditation. Popular mantras in this tradition include Namo Buddhaya ("Homage to the Buddha") and Araham ("Worthy One"). In Buddhism in China and Vietnam, ten small mantras were finalized by the monk Yulin (玉琳國師), a teacher of the Shunzhi Emperor for monks, nuns, and laity to chant in the morning. Along with the ten mantras, the Great Compassion Mantra, the Shurangama Mantra of the Shurangama, Heart Sutra and various forms of nianfo are also chanted. The Shurangama Mantra may be the longest mantra. There are Thai Buddhist amulet katha: that is, mantras to be recited while holding an amulet. Kūkai (774–835), a noted Buddhist monk, advanced a general theory of language based on his analysis of two forms of Buddhist ritual language: dharani (dhāra.nī) and mantra. Mantra is restricted to esoteric Buddhist practice whereas dharani is found in both esoteric and exoteric ritual. Dharanis for instance are found in the Heart Sutra. The term "shingon" is the Japanese pronunciation of the Chinese transcription of the Sanskrit word "mantra", 真言 (zhēnyán). The word dharani derives from a Sanskrit root dh.r which means to hold or maintain. Ryuichi Abe suggests that it is generally understood as a mnemonic device which encapsulates the meaning of a section or chapter of a sutra. Dharanis are also considered to protect the one who chants them from malign influences and calamities. The term mantra is traditionally said to be derived from two roots: man, to think; and the action-oriented suffix -tra. Thus a mantra can be considered to be a linguistic device for deepening one's thought or in the Buddhist context for developing the enlightened mind. They have also been used as magic spells for purposes such as attaining wealth and long life and eliminating enemies. In daily living, many thought the pronunciation of the mantra was not important to take its effect and the expected effect, may not happen because of fixed karma (定業), or because there appears a better way to solve the situation. The distinction between dharani and mantra is hard to make. We can say that all mantras are dharanis but that not all dharanis are mantras. Mantras do tend to be shorter. Both tend to contain some unintelligible phonic fragments such as Om, or Hu.m, which is perhaps why some people consider them to be essentially meaningless. Kūkai made mantra a special class of dharani which showed that every syllable of a dharani was a manifestation of the true nature of reality – in Buddhist terms that all sound is a manifestation of shunyata or emptiness of self-nature. Thus rather than being devoid of meaning, Kūkai suggests that dharanis are in fact saturated with meaning – every syllable is symbolic on multiple levels. One of Kūkai's distinctive contributions was to take this symbolic association even further by saying that there is no essential difference between the syllables of mantras and sacred texts, and those of ordinary language. If one understood the workings of mantra, then any sounds could be a representative of ultimate reality. This emphasis on sounds was one of the drivers for Kūkai's championing of the phonetic writing system, the kana, which was adopted in Japan around the time of Kūkai. He is generally credited with the invention of the kana, but there is apparently some doubt about this story amongst scholars. This mantra-based theory of language had a powerful effect on Japanese thought and society which up until Kūkai's time had been dominated by imported Chinese culture of thought, particularly in the form of the Classical Chinese language which was used in the court and amongst the literati, and Confucianism which was the dominant political ideology. In particular, Kūkai was able to use this new theory of language to create links between indigenous Japanese culture and Buddhism. For instance, he made a link between the Buddha Mahavairocana and the Shinto sun Goddess Amaterasu. Since the emperors were thought to be descended form Amaterasu, Kūkai had found a powerful connection here that linked the emperors with the Buddha, and also in finding a way to integrate Shinto with Buddhism, something that had not happened with Confucianism. Buddhism then became essentially an indigenous religion in a way that Confucianism had not. And it was through language and mantra that this connection was made. Kūkai helped to elucidate what mantra is in a way that had not been done before: he addresses the fundamental questions of what a text is, how signs function, and above all, what language is. In this, he covers some of the same ground as modern day Structuralists and others scholars of language, although he comes to very different conclusions. Mantrayana (Sanskrit), which may be translated as "way of the mantra", was the original self-identifying name of those that have come to be determined 'Nyingmapa'. The Nyingmapa which may be rendered as "those of the ancient way", a name constructed due to the genesis of the Sarma "fresh", "new" traditions. Mantrayana has developed into a synonym of Vajrayana. Noted translator of Buddhist texts Edward Conze (1904–1979) distinguishes three periods in the Buddhist use of mantra. Initially, according to Conze, like their fellow Indians, Buddhists used mantra as protective spells to ward off malign influences. Despite a Vinaya rule which forbids monks engaging in the Brahminical practice of chanting mantras for material gain, there is a number of protective mantras for a group of ascetic monks. However, even at this early stage, there is perhaps something more than animistic magic at work. Particularly in the case of the Ratana Sutta the efficacy of the verses seems to be related to the concept of "truth". Each verse of the sutta ends with "by the virtue of this truth may there be happiness". Conze notes that later mantras were used more to guard the spiritual life of the chanter, and sections on mantras began to be included in some Mahayana sutras such as the White Lotus Sutra, and the Lankavatara Sutra. The scope of protection also changed in this time. In the Sutra of Golden Light the Four Great Kings promise to exercise sovereignty over the different classes of demigods, to protect the whole of Jambudvipa (the Indian subcontinent), to protect monks who proclaim the sutra, and to protect kings who patronise the monks who proclaim the sutra. The apotheosis of this type of approach is the Nichiren school of Buddhism that was founded in the 13th century Japan, and which distilled many previously complex Buddhist practices down to the veneration of the Lotus Sutra through a recitation of the daimoku: "Nam myoho renge kyo" which translates as "Homage to the Lotus Sutra". The third period began, according to Conze, in about the 7th century, to take center stage and become a vehicle for salvation in their own right. Tantra started to gain momentum in the 6th and 7th century, with specifically Buddhist forms appearing as early as 300CE. Mantrayana was an early name for what is now more commonly known as Vajrayana, which gives us a hint as to the place of mantra in Indo-Tibetan Buddhism. The aim of Vajrayana practice is to give the practitioner a direct experience of reality, of things as they really are. Mantras function as symbols of that reality, and different mantras are different aspects of that reality – for example wisdom or compassion. Mantras are often associated with a particular deity, one famous exception being the Prajnaparamita mantra associated with the Heart Sutra. One of the key Vajrayana strategies for bringing about a direct experience of reality is to engage the entire psycho-physical organism in the practices. In one Buddhist analysis, the person consists of 'body, speech and mind' (refer: Three Vajra). So a typical sadhana or meditation practice might include mudras, or symbolic hand gestures; the recitations of mantras; as well as the visualisation of celestial beings and visualising the letters of the mantra which is being recited. Clearly here mantra is associated with speech. The meditator may visualise the letters in front of themselves, or within their body. They may be pronounced out loud, or internally in mind only. Om mani padme hum on the Gangpori (photo 1938–1939 German expedition to Tibet. Probably the most famous mantra of Buddhism is Om mani padme hum, the six syllable mantra of the Bodhisattva of compassion Avalokiteśvara (Tibetan: Chenrezig, Chinese: Guanyin). This mantra is particularly associated with the four-armed Shadakshari form of Avalokiteśvara. The Dalai Lama is said to be an incarnation of Avalokiteshvara, and so the mantra is especially revered by his devotees. The book Foundations of Tibetan Mysticism by Lama Anagarika Govinda, gives a classic example of how such a mantra can contain many levels of symbolic meaning. Donald Lopez gives a good discussion of this mantra and its various interpretations in his book Prisoners of Shangri-LA: Tibetan Buddhism and the West. Lopez is an authoritative writer and challenges the stereotypical analysis of the mantra as meaning "The Jewel in the Lotus", an interpretation that is not supported by either a linguistic analysis, nor by Tibetan tradition, and is symptomatic of the Western Orientalist approach to the 'exotic' East. He suggests that Manipadma is actually the name of a bodhisattva, a form of Avalokiteshvara who has many other names in any case including Padmapani or lotus flower in hand. The Brahminical insistence on the absolutely correct pronunciation of Sanskrit broke down as Buddhism was exported to other countries where the inhabitants found it impossible to reproduce the sounds. So in Tibet, for instance, where this mantra is on the lips of many Tibetans all their waking hours, the mantra is pronounced Om mani pema hung. The following list of mantras is from Kailash: A Journal of Himalayan Studies, Volume 1, Number 2, 1973. (pp. 168–169) (augmented by other contributors). It also includes renderings of Om mani padme hum. The mantras used in Tibetan Buddhist practice are in Sanskrit, to preserve the original mantras. Visualizations and other practices are usually done in the Tibetan language. Om vagishvara hum This is the mantra of the Mahabodhisattva Manjusri, Tibetan: Jampelyang (Wylie "'jam dpal dbyangs")... The Buddha in his wisdom aspect. Om mani padme hum The mantra of Avalokitesvara, Mahabodhisattva, the Buddha in his compassion aspect. Om vajrapani namo hum The mantra of the Buddha as Protector of the Secret Teachings. i.e. : as the Mahabodhisattva Channa Dorje (Vajrapani). Om vajrasattva hum The short mantra for White Vajrasattva, there is also a full 100-syllable mantra for Vajrasattva. Om ah hum vajra guru padma siddhi hum The mantra of the Vajraguru Guru Padma Sambhava who established Mahayana Buddhism and Tantra in Tibet. Om tare tuttare ture mama ayurjnana punye pushting svaha The mantra of Dölkar or White Tara, the emanation of Arya Tara [Chittamani Tara]. Variants: Om tare tuttare ture mama ayurjnana punye pushting kuru swaha (Drikung Kagyu), Om tare tuttare ture mama ayu punye jnana puktrim kuru soha (Karma Kagyu). Om Tare Tutare Ture Soha. Om tare tuttare ture svaha, mantra of Green Arya Tara—Jetsun Dolma or Tara, the Mother of the Buddhas: om represents Tara's sacred body, speech, and mind. Tare means liberating from all discontent. Tutare means liberating from the eight fears, the external dangers, but mainly from the internal dangers, the delusions. Ture means liberating from duality; it shows the "true" cessation of confusion. Soha means "may the meaning of the mantra take root in my mind." According to Tibetan Buddhism, this mantra (Om tare tutare ture soha) can not only eliminate disease, troubles, disasters, and karma, but will also bring believers blessings, longer life, and even the wisdom to transcend one's circle of reincarnation. Tara representing long life and health. oṃ amaraṇi jīvantaye svāhā (Tibetan version: oṃ ā ma ra ṇi dzi wan te ye svā hā) The mantra of the Buddha of limitless life: the Buddha Amitayus (Tibetan Tsépagmed) in celestial form. Om dhrung svaha The purification mantra of the mother Namgyalma. Om ami dhewa hri The mantra of the Buddha Amitabha (Hopagmed) of the Western Pureland, his skin the color of the setting sun. Om ami dewa hri The mantra of Amitabha (Ompagme in Tibetan). Om ah ra pa ca na dhih The mantra of the "sweet-voiced one", Jampelyang (Wylie "'jam dpal dbyangs") or Manjusri, the Bodhisattva of wisdom. Namo bhagavate Bhaishajya-guru vaidurya-praba-rajaya tathagataya arhate samyak-sambuddhaya tadyata *Tadyata OM bhaishajye bhaishajye maha bhaishajya raja-samudgate svaha The mantra of the 'Medicine Buddha', from Chinese translations of the Master of Healing Sutra. There are mantras in Bön and some Chinese sects. Nam Myōhō Renge Kyō The mantra of the Nichiren Buddhism. Ná Mó Běn Shī Dà Zì Zai Wáng Fó (南無本師大自在王佛) The mantra of the Buddhayana sect (佛乘宗). Námó Tiānyuán Tàibǎo Āmítuófó (南無天元太保阿彌陀佛) The mantra of Xiantiandao and Shengdao. Wú Tài Fó Mí Lè (無太佛彌勒) The mantra of Yiguandao. The mantra in Chinese Buddhist canon are collected by Qianlong Emperor into a book. Kuang-Ming Lin (林光明) amended it. Bahá’ís recite the mantra "Alláh-u-Abha" 95 times a day. Many use beads. In the Sikh religion, a mantar or mantra is a Shabad (Word or hymn) from the Adi Granth to concentrate the mind on God. Through repetition of the mantra, and listening to one's own voice, thoughts are reduced and the mind rises above materialism to tune into the voice of God. Mantras in Sikhism are fundamentally different from the secret mantras used in other religions. Unlike in other religions, Sikh mantras are open for anyone to use. They are used openly and are not taught in secret sessions but are used in front of assemblies of Sikhs. The Mool Mantar, the first composition of Guru Nanak, is the second most widely known Sikh mantra. The most widely known mantra in the Sikh faith is "Wahe Guru." According to the Sikh poet Bhai Gurdas, the word "Wahe Guru" is the Gurmantra, or the mantra given by the Guru, and eliminates ego. According to the 10th Sikh Master, Guru Gobind Singh, the "Wahe Guru" mantra was given by God to the Order of the Khalsa, and reforms the apostate into the purified. There are mantras in Taoism, such as the words in Dafan yinyu wuliang yin (大梵隱語無量音) and the Tibetan Buddhism mantra om (唵). There are mantras in Cheondoism, Daesun Jinrihoe, Jeung San Do and Onmyōdō. Rabbit rabbit rabbit, superstition periodic mantra. ^ This is a Buddhist chant. The words in Pali are: Buddham saranam gacchami, Dhammam saranam gacchami, Sangham saranam gacchami. The equivalent words in Sanskrit, according to Georg Feuerstein, are: Buddham saranam gacchâmi, Dharmam saranam gacchâmi, Sangham saranam gacchâmi. The literal meaning: I go for refuge in knowledge, I go for refuge in teachings, I go for refuge in community. In some traditions of Hinduism, the mantra is expanded to seven lines, with first word of the additional lines being Satyam (truth), Ahimsam (non-violence), Yogam (yoga) and Ekam (one universal life). For example, an additional line with Ahimsam is: Ahimsam saranam gacchâmi. ^ "mantra". Random House Webster's Unabridged Dictionary. ^ a b Jane Marie Law (1995). Religious Reflections on the Human Body. Indiana University Press. pp. 173–174. ISBN 0-253-11544-2. ^ Macdonell, Arthur A., A Sanskrit Grammar for Students § 182.1.b, p. 162(Oxford University Press, 3rd edition, 1927). ^ Whitney, W.D., Sanskrit Grammar § 1185.c, p. 449(New York, 2003, ISBN 0-486-43136-3). ^ Schlerath, Bernfried (1987). ""Aša: Avestan Aša"". Encyclopaedia Iranica. 2. New York: Routledge. pp. 694–696. ^ "Mantra" Archived 7 November 2016 at the Wayback Machine. Oxford Living Dictionary. ^ "Mantra" Archived 29 June 2017 at the Wayback Machine. Cambridge Dictionary. ^ Spencer, L. (2015). Flotation: A Guide for Sensory Deprivation, Relaxation, & Isolation Tanks. ISBN 1329173759, ISBN 978-1329173750, p. 57. ^ Beck, G.L. (1995). Sonic Theology: Hinduism and Sacred Sound. Motilal Banarsidass Publ. p. 165. ^ Shear Jonathon (Editor), The Experience of Meditation: Experts Introduce the Major Traditions,pg.28.Paragon House. St Paul, MN.,2006. ^ In Hinduism, frequent repetition at opportune moments is a common type of japa. ^ Eknath Easwaran (2008). Mantram Handbook (see article) (5th ed.). Tomales, CA: Nilgiri Press. ISBN 1-58638-028-1 (originally published 1977). ^ Bormann, J. E.; Thorp, S.; Wetherell, J. L.; Golshan, S. (2008). "A spiritually based group intervention for combat veterans with posttraumatic stress disorder: Feasibility study". Journal of Holistic Nursing. 26 (2): 109–16. doi:10.1177/0898010107311276. PMC 4083747. PMID 18356284. ^ Kornfield, j. Modern Buddhist masters, pg 311. ^ Stede, William (1993). Rhys Davids, TW (ed.). The Pali-English dictionary (1. Indian ed.). New Delhi: Motilal Banarsidass. ISBN 8120811445. Archived from the original on 25 May 2017. ^ Desaransi, Phra Ajaan Thate (2 November 2013). "Buddho". Access to Insight (Legacy Edition). Translated by Thanissaro, Bhikkhu. Archived from the original on 5 June 2018. ^ "Pinyin of ten mantras". Web.archive.org. 24 March 2007. Archived from the original on 24 March 2007. Retrieved 17 July 2012. ^ "A mini reference archive library of compiled Buddhist Katha/Katta". Mir.com.my. Archived from the original on 26 June 2012. Retrieved 17 July 2012. ^ Alex Wayman; Ryujun Tajima (1992). The Enlightenment of Vairocana. Motilal Banarsidass. pp. 225, 254, 293–294. ISBN 978-81-208-0640-5. ^ "雪域佛教". Archived from the original on 12 July 2012. Retrieved 17 July 2012. ^ "普傳各種本尊神咒". Buddhasun.net. Archived from the original on 15 March 2012. Retrieved 17 July 2012. ^ "Mantra – 真佛蓮花小棧(True Buddha Lotus Place)". Lotushouse.weebly.com. 27 February 2010. Archived from the original on 13 March 2012. Retrieved 17 July 2012. ^ "本師『大自在王佛』的出處". Epaper.buddhayana.info. 15 May 2004. Archived from the original on 25 April 2012. Retrieved 17 July 2012. ^ "畫符念咒：清代民間秘密宗教的符咒療法" (PDF). Archived from the original (PDF) on 1 March 2012. Retrieved 17 July 2012. ^ "人生守則廿字真言感恩、知足、惜福，天帝教祝福您！". Tienti.info. Archived from the original on 1 March 2012. Retrieved 17 July 2012. ^ a b Tālib, Gurbachan Siṅgh (1992). "MŪL MANTRA". Encyclopaedia of Sikhism. Patiala: Punjabi University. Retrieved 19 September 2010. ^ Gurdas, Bhai. "GUR MANTRA". SikhiTotheMax. Retrieved 9 September 2018. ^ "口遊". S.biglobe.ne.jp. Retrieved 18 July 2012. Beyer, S. Magic and ritual in Tibet: the cult of Tara. (Delhi: Motilal Banarsisdass, 1996). Conze, E. Buddhism : its essence and development. (London : Faber, c1951). Gelongma Karma Khechong Palmo. Mantras On The Prayer Flag. Kailash: A Journal of Himalayan Studies, Volume 1, Number 2, 1973. (pp. 168–169). Govinda (Lama Anagarika). Foundations of Tibetan Mysticism. (London : Rider, 1959). Mullin, G.H. The Dalai Lamas on Tantra, (Ithaca : Snow Lion, 2006). The Rider Encyclopedia of Eastern Philosophy and religion. (London : Rider, 1986). Skilton, A. A concise history of Buddhism. (Birmingham : Windhorse Publications, 1994). Sangharakshita. Transforming Self and World: themes from the Sutra of Golden Light. (Birmingham : Windhorse Publications, 1994). Wikimedia Commons has media related to Mantras.